For the last five months, community and labor activists, most of them young, have sat down in front of buses carrying people to detention centers for deportation. In Tucson, they obstructed and chained themselves to Immigration and Customs Enforcement Agency (ICE) buses. In San Francisco, a month after blocking a bus carrying deportees to detention, “Dreamer” Ju Hong—a young immigrant whose deportation was deferred in the White House's executive action two years ago—challenged President Obama during a local speech. “You have the power to stop deportation,” the protester told him. And the pressure is only intensifying. 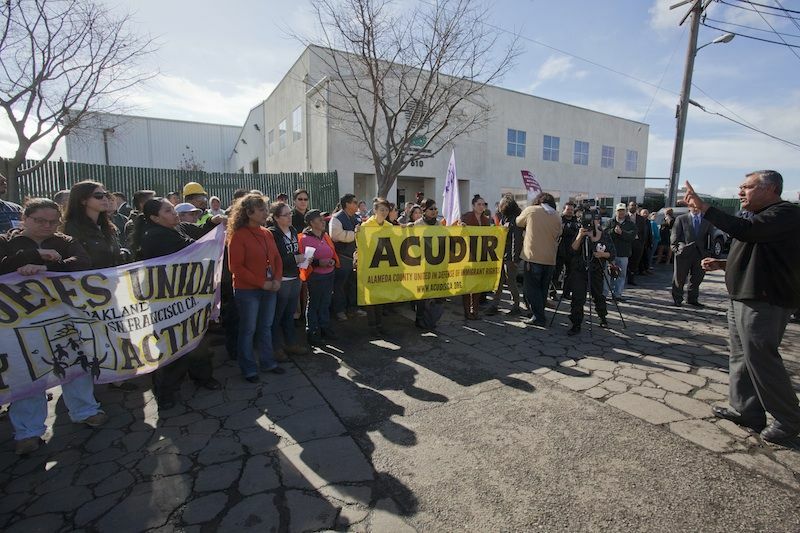 Last week, unions and community organizations closed down an intersection in front of a Silicon Valley supermarket chain where hundreds were fired after an I-9 audit: an ICE inspection of company personnel records, intended to identify undocumented workers for termination. 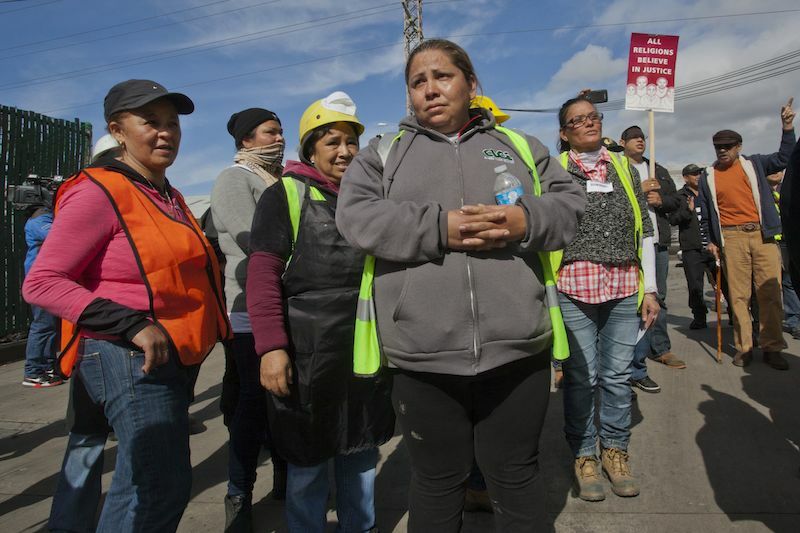 The next day, immigrant workers in one San Leandro, Calif. recycling facility walked out of work when their employer and ICE threatened their jobs in a similar audit. These protests are a direct response to the deportations and firing that have intensified as a result of the Obama administration's immigration enforcement policies. Over the last five years, thousands of workers have been fired through immigration audits and the use of the E-Verify database. In the same period, about 400,000 people have been deported every year—totaling almost two million. Special federal courts, called "Operation Streamline," convene daily, passing quick judgment on the migrants led into the courtroom in chains, and sending them to prison, jail or privately run "detention centers." More than 300,000 people each year spend some time in these immigration prisons. In Washington, D.C., some organizations have continued to pressure Congress to take a vote on the Comprehensive Immigration Reform legislation (S. 744 and H.R. 15). But the actions in the streets hardly mention the bills. 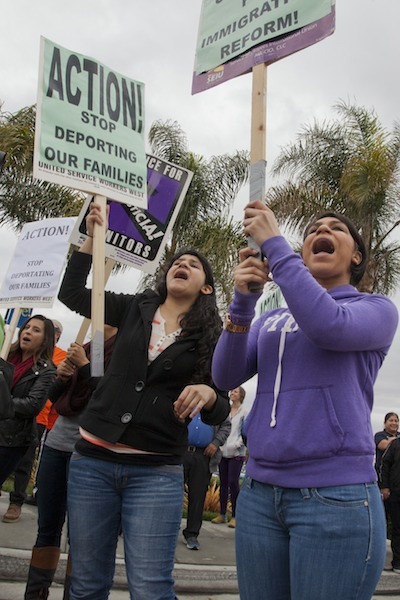 Some grassroots groups no longer support them at all, because they contain increased enforcement measures that would make firings and deportations even more widespread than they already are. In fact, many community organizations and unions outside of the country's capital have largely abandoned the idea that Congress can or will pass any laws that would end mass deportations and safeguard the jobs and labor rights of immigrant workers. These grassroots protesters instead want the Obama administration to immediately use its executive authority to stop deportations and firings, without waiting for Congress. Even beltway groups like the National Council of La Raza, which until recently insisted that the CIR bills were the only way forward, have demanded an end to mass deportations. At a rally to support the strikers in San Leandro, worker Ampara Romo appealed to supporters, saying, "I ask everyone to try to change the laws being used against us right now, because they are unjust and cause so much harm to families and our community in general." When the recycling workers went on strike to protest firings, they were calling for the right to live as equals, as full participants in society, and to work without fear. The unions and groups supporting them—as well as those around the country—seek an immigration reform that rises from locally based actions and advances toward equality. They reject the reforms in Congress because they create a second-class tier of people with fewer rights who are subject to ferocious enforcement. These photographs show the determination and courage of immigrant workers, their families and allies—going on strike against the prospect of losing their jobs, sitting down in the street in civil disobedience, and demanding a radical change in immigration policy. OAKLAND, CALIF.—Jamie Herrera is a worker at a recycling facility in Oakland, where employees went on strike on July 30, 2013 to protest bad wages, unsafe working conditions and ICE audits. Previously, Herrera had been a skilled union worker at a local foundry. He lost his job there because of an earlier I-9 audit; the Department of Homeland Security accused him of lacking legal status and forced his employer to fire him. EAST PALO ALTO, CALIF.—Rogelio Marquez was fired from the Mi Pueblo Latino supermarket chain in last year's massive I-9 audit. According to employees, Mi Pueblo used the audit and DHS immigration enforcement actions as a means to terrorize its workers when they began to organize a union. 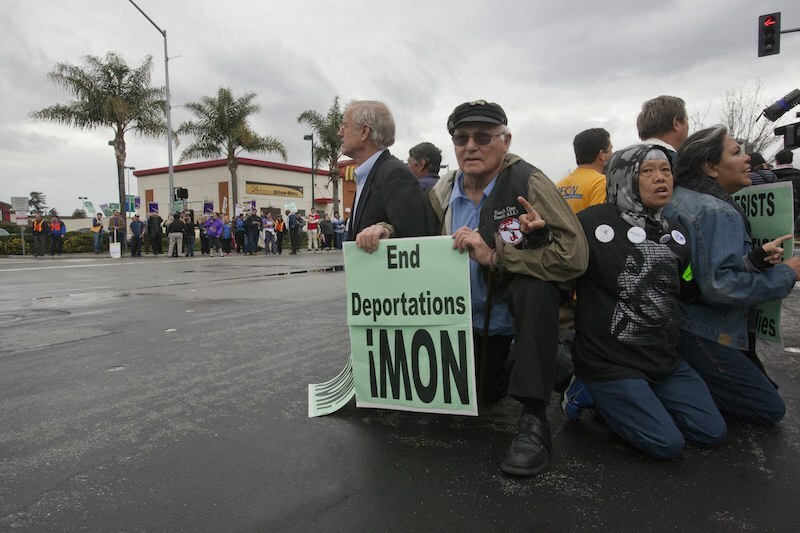 On Feb. 26, 2014, Marquez speaks in front of the Mi Pueblo market in East Palo Alto at the start of a rally demanding a moratorium on deportations and firings. EAST PALO ALTO, CALIF.—The assembled crowd of community members and students at Mi Pueblo includes many who received temporary legal status when President Obama granted it to the Dreamers in an executive order in 2012. They demand this program of "deferred action" be extended to their families, as part of a broader moratorium on deportations. EAST PALO ALTO, CALIF.—Immigrants, workers, union members, people of faith and community activists block an intersection in front of the Mi Pueblo market. 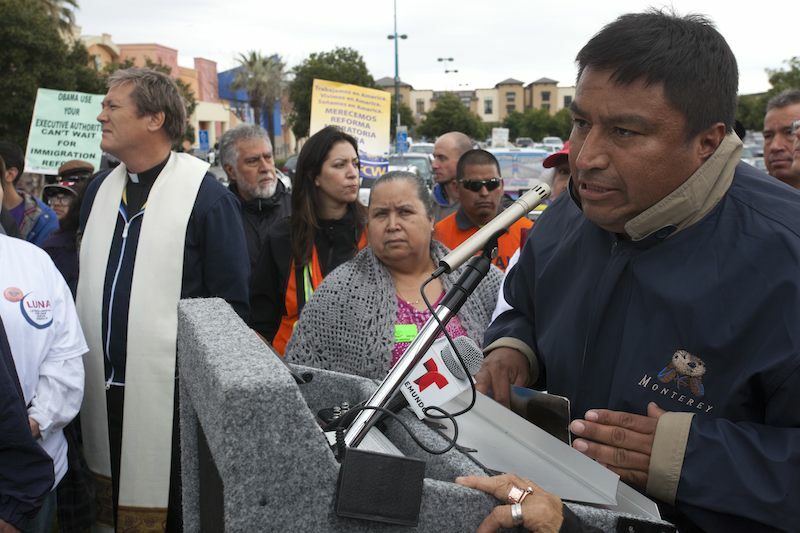 EAST PALO ALTO, CALIF.—In an act of civil disobedience, Silicon Valley immigrant rights activists, including labor organizers Fred Hirsch and Gerardo Dominguez, and Father Jon Pedigo, sit down in the middle of an intersection. Community sympathy for the demonstrators is so strong that the police eventually decided not to arrest anyone. SAN LEANDRO, CALIF.—On Feb. 27. 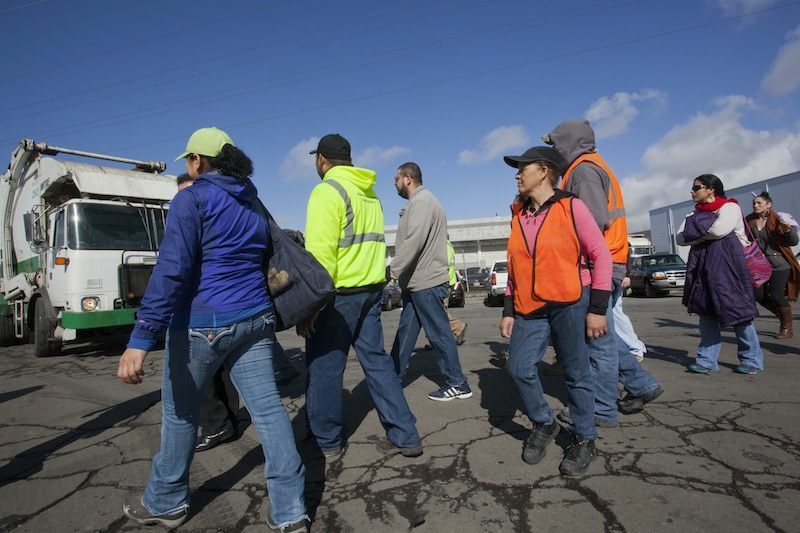 2014, workers at a recycling facility walk out to protest the company's decision to fire employees accused of not having legal immigration status. They also blocked trucks hauling trash from entering the facility. Workers say the company was paying $8.30 an hour; San Leandro's living wage ordinance requires $14.17. After five employees filed a suit over the wage theft, they say, the company used the threat of immigration enforcement to retaliate. Maria Granados, one of the suing workers, points out, "One month after we sued them they started calling people into the office to say there were problems with our documents. Some of us have been there 14 years, so why now?" 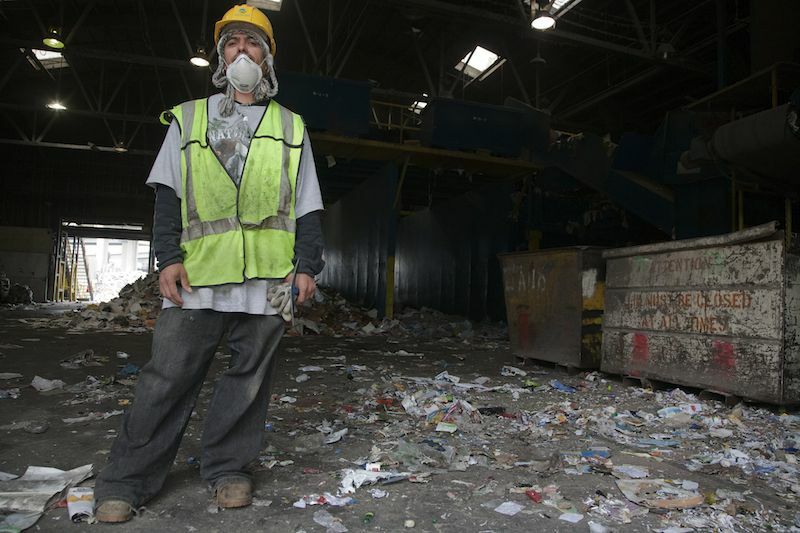 SAN LEANDRO, CALIF.—The striking immigrant recycling workers are supported by community leaders from a dozen organizations and unions. Although the employees had no union contract, they were assisted in the strike by the International Longshore and Warehouse Union Local 6 and ILWU organizer Agustin Ramirez. According to the workers, the temp agency that employs them threatened to fire anyone who participated in the walkout, but the workers demanded the agency respect their right to strike. SAN LEANDRO, CALIF.—Rev. Pablo Morataya leads workers in a prayer to give them courage during the strike. 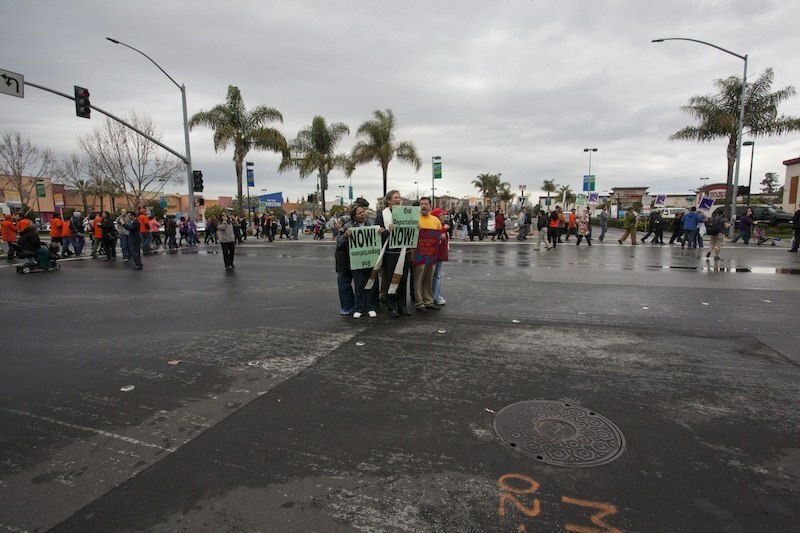 A bus carrying fasters from the national Fast for Families campaign stopped at the strike to join them. The fasters, who are leading a charge to demand a moratorium on deportations, spoke at the rally about the importance of stopping the firings; in turn, the workers demanded a moratorium on deportations as well. 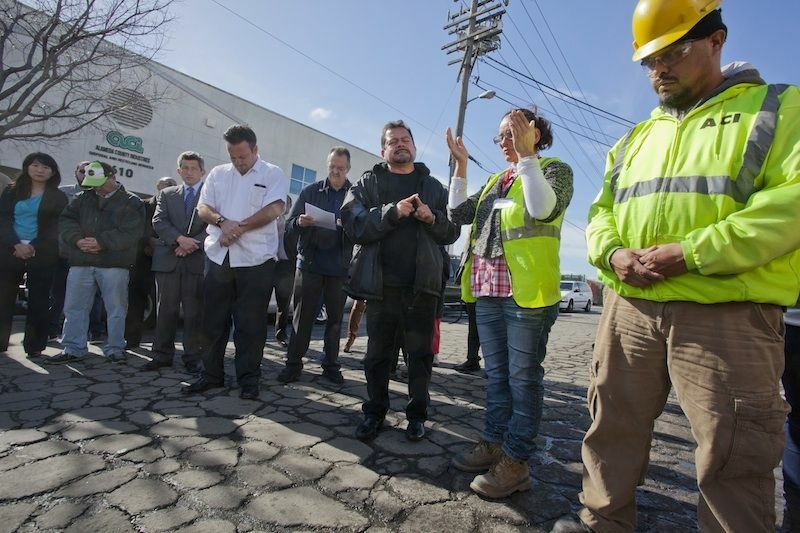 SAN LEANDRO, CALIF.—Workers and supporters stand blocking the company driveway. After an hour, the company sent them home, but agreed to pay them for the day and allowed them to go back to work the following day. The next week, however, organizers say the workers listed as undocumented in the I-9 audit were all fired. Illegals receive more than equal treatment; they receive PREFERENTIAL treatment, even over our own disabled! The U.S. govt reimburses ERs and hospitals for each illegal they treat (courtesy of the commie liberals) which directly affects length of stay, quality of care, meds received, and any follow-up such as physical therapy and/or transfer to a convalescent facility (or NOT if you’re disabled and white). Try sitting for 16 hours on a hard plastic chair (after putting in a 10-hour workday) with your disabled friend that lives in pain 24/7 and never gets a break from it; never a day off from pain. Do this for 26 YEARS. And all the while ABLE-BODIED illegals are tying up precious time, doctors, and resources in the ER for hours since they get FREE medical at every ER, hospital and clinic. Instead they would rather STEAL from the disabled and the taxpayers, who are forced to pay for those able-bodied thieves. If the democrats want to whine and snivel over someone, try crying for those who are receiving less than equal care! It is us – yet we have to pay not only our own bills but those of the stealing illegals as well. This is nothing less than financial slavery. How arrogant they are to demand preferential treatment over everyone else and take cuts ahead of those who have worked and waited for years to become responsible citizens. Illegals are NOT persons of good character; quite the opposite. Don't kid yourself, Sport....capital can only "cross international boundaries" WITH "the consent of [the] governments" involved. Or do you believe that capital is freely able to move [outbound] across the borders of countries such as Venezuela today? Or Cuba? Etc., etc. The "free trade" agreements you mentioned are, to put it bluntly the "consent" you denied capital as having. As far as legislation that "restricted the outflow of capital out of the country", I don't recall any "past regulations" of the sort...particularly any that were effective. Just the opposite, in fact. Look, if YOU want the illegal aliens in your little universe, then YOU take it upon YOURSELF to support them; i.e. - to PERSONALLY offer them jobs, to PERSONALLY provide for their educational expenses, to PERSONALLY insure that they don't interfere with the interests of LEGITIMATE residents. Then maybe you'd have the right to blather a bit like you have. But, until then, might I suggest you educate yourself a bit in terms of our nation's history, it's economy, and the laws and regulations it has functioned under. More remarks please. If they are here and have a Green Card Work Permit that is one Issue. The farm workers would be hard to be replaced. Many are lied to and brought here by business for cheap labor and the government gives the company tax breaks, looks the othere way. Remember the 50,000 Tech Green card worker from last year and the 50,000 requested for this year. Many US students who graduated in the IT fields did not find the jobs they expected. Our government allows colleges to to bring in green card workers to teach in the college level and they are not required to speak the English language. They do not have to meet the same standards as US College Grads. Need to show how people are being used and in many ways raped by the system. it is hell for these people and is that the future for the rest of us. I am an immigrant (now US citizen). The definition on an immigrant is "alien with legal presence) Immigrants are LPR's (Legal permanent residents. Please don't refer to people who violated our immigration laws as "immigrants". It is not true. It is a lie. We are glad to see all this action by immigrant groups. We need to understand that the neo-liberal Senate passed an Immigration Bill that was market-based and tied to TPP. This bill will impoverish and enslave immigrant workers far more than help them. It was always meant as a way to boost profits for global corporations. So, we need to step away from this Immigration Bill until we can get rid of the neo-liberals in Congress by running and voting for labor and justice candidates in all democratic primaries! Citizenship Now is the only way to go for those families having history in the US. Capital has the right to cross international boundaries without the consent of governments in search of the best opportunity to make money. It is called Free Trade (NAFTA, GATT, WTO, FSA, etc. ), also referred to as Free Market Capitalism. However, labor is denied the right to cross international boundaries without the consent of governments in search of the best opportunity to make money. What's free about that? According to Adam Smith's "invisible hand of capitalism", if everybody acts in their own self interest in search of the best opportunity to make money, overall, society does the right thing for everyone and everyone is better off. Plus, we all get puppies! Are Adam Smith, Milton Friedman, and all the rest of the "free market capitalists" wrong? Isn't the real harm done to the country of which you speak due to the "Free Trade" repeal of past regulations that restricted the outflow of capital out of the country (a kind of emmigration law enforced against capital), which forced the capitalist to invest in our own country, and workers, rather than invest in a foreign country and foreign workers? If you don't have a good paying job with benefits, blame the capitalist who sold you, your job, and your country out to the lowest foreign bidder, not the immigrants! let's get this straight. they have no right to be here. NONE they are harming the country. simple we have a labor surplus as well as an economic down turn. illegals seeking any job puts a burden on our economy if they were gone today 8 million Americans would have jobs tomorrow with a probability of rising wages both a real boost to the economy. their children put an unplanned stress on our school system both in classroom size and the burden of teaching in another language until their spawn learns English. remember that even though they pay some taxes our school systems are funded multigenerationally. even in agriculture they can be easily replaced by the temporary worker programs and advanced agricultural practices. there is no rational reason to put up with this. even if they were the last nail in the Republican coffin it''s still wrong although I would be greatly amused. the criminals who employ them are the key. faced with jail time they will quickly replace illegal workers and jobs are the only reason they come here and without jobs they will have no reason to stay.